Despite backing the brutal regime of Bashar Assad in the Syrian Civil War, allegedly trying to meddle in 2016 U.S. elections and working to support far-right French presidential candidate Marine Le Pen, Russian President Vladimir Putin’s image in the U.S. has improved just a tad. According to a recent Gallup poll, 22 percent of Americans have a favorable view of the Russian president (up from 13 percent in 2015). That number is three points higher than American approval ratings for Congress and the highest favorability number for Putin since 2003. 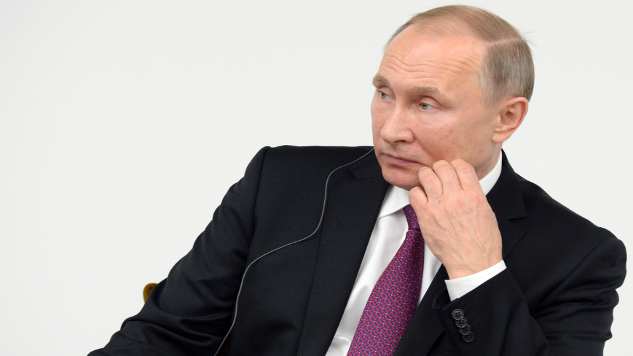 Among Republicans, Putin’s favorability has more than doubled in the past year, rising from 12 percent to 32 percent. Meanwhile, favorability of Russia’s leader in Democratic circles dropped from 15 percent down to 10 percent. The splits on favorability for Russia are similar to the numbers seen for Putin. Republican favorability of Russia currently sits at 35 percent while Democrats hold just a 16 percent favorable view of the Russian Federation. As with all polls, it’s worth pointing out that there is a margin of error. In this case, Gallup’s is 4 percentage points, so overall favorability for Putin could be as high as 26 percent or as low as 18 percent. Either way, his unfavorables are considerably high, but are decreasing ever so slightly. Watch John Oliver illustrate why that’s troubling here.